SwissTropicals LLC and its owner are not responsible for and have no influence on the content of any of the linked websites. They are provided for informational purposes only. Any explicit or implied liability for the information provided herein is hereby declined. Planet Catfish the ultimate catfish information website. Period! IG BSSW the International Barb, Tetra, Loach, and Catfish association. All Catfish Species Inventory presents the NSF project to describe all living catfish species. Aspidoras information about the genus Aspidoras (in German). Jonathan W. Armbruster studies Loricariidae systematics. L-Welse deals with various aspects of L-numbers (in German). CorydorasWorld best website about Corydoradinae. Welse.net another good website dealing with catfish (in German). VDA AK Wasserpflanzen the German waterplant association (in German). Las Lucanas a waterplant nursery on the Canary Islands. Out of Africa specializes in succulent plants from Africa and Madagascar. VDA AK Lebendgebärende Aquarienfische German Livebearer Working Group (in German). Deutsche Gesellschaft für Lebendgebärende Zahnkarpfen the German Livebearer Association (in German). Deutsche Guppy Föderation the German Guppy Federation (in German). Deutsche Killifisch Gemeinschaft the German Killifish Association (in German). Internationale Gemeinschaft für Regenbogenfische (in German). Internationale Gemeinschaft für Labyrinthfische (in German). Loaches online follows these bottom dwellers. Schmerlen.de is another loach site (in German). Danios and Devarios popular cyprinids. David Parichy studies molecular evolution and development of the Danionins. Arbeitsgemeinschaft Wirbellose Tiere great information on inverts (in German). Garnelenforum inverts forum (in German). crystalred.de about the famous shrimp (in German). Crystal Red shrimp were first bred by Hisayasu Suzuki, Nagoya, Japan. 1a-wirbellose offers various shrimps and crayfish. German Cichlid Association Deutsche Cichliden Gesellschaft (in German). Raffles Museum of Biodiversity Research at the National University of Singapore. Ichthyology database of the Swedish Museum of Natural History. Fish Ecology & Evolution University of Berne, Switzerland. ASIH American Society of Ichthyologists and Herpetologists. Aquaculture Program by the USDA Agricultural Research Service. OCAD Ohio Center for Aquaculture Development. IFAS Institute of Food and Agricultural Science, University of Florida. Tropical Aquaculture Laboratory, University of Florida. San Diego Zoo Global Wildlife Conservancy. The Academy of Natural Sciences, Ichthyology Collection. Thomas Meinelt, Leibniz-Institute of Freshwater Ecology and Inland Fisheries, Berlin, Germany. Joerg Freyhof, Leibniz-Institute of Freshwater Ecology and Inland Fisheries, Berlin, Germany. Gerald Urquhart, Michigan State University. Northeast Council of Aquarium Societies. Canadian Association of Aquarium Clubs. Federation of American Aquarium Societies. Aquaristics Scene Switzerland (in German). VDA Federation of German vivarium clubs (in German). ZZF German Pet Trade & Industry Association. International Federation of Online Clubs and Aquatic Societies. Pet Industry Joint Advisory Council. Weichwasserfische by Michael Schlüter (in German & English). Aquaristik – Homepage Michael Taxacher (in German). Adventures in Aquascaping by Tim Gross details a beautiful tank setup. Aquarienbastelei by Gerd Arndt, fantastic website on useful gadgets (in German). PecesCriollos by Stefan Körber fishes of Argentina (in English, German, & Spanish). All about live foods by Christian Westhäuser (in German). Hamburg Mattenfilter by Olaf Deters (in German). Brian W. Coad’s Personal Website. It Rains Fishes by Frans Vermeulen. Catalog of Fishes by the California Academy of Sciences. BOLD Barcode of Life Data Systems. ZFIN zebrafish model organism database. Zebrafish Genome Resources at NCBI. Hippocampus is a commercial picture archive. WorldClimate for records of world climate data. Aquatic Animal Imports Canadian Food Inspection Agency. Extreme Aquatic Foods. This is the staple diet in my hatchery! 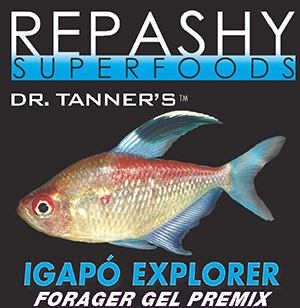 Repashy Superfoods. They are super in any respect. Great Salt Lake Brine Shrimp Cooperative. Utah Division of Wildlife Resources manages brine shrimp. Artemia Reference Center University of Ghent, Belgium. Tetra USA, part of United Pet Group. DT’s Plankton Innovative Marine Aquaculture. Fish diseases University of Florida. Aquatic Animal Health Research USDA. Composition of Common Medications (in German). Reef to Rainforest Media. Publisher of AMAZONAS and CORAL. Natur und Tier Verlag (in German). Tropical Fish Hobbyist, part of Central Garden & Pet. Aqueon, part of Central Garden & Pet. Oceanic Systems, part of Central Garden & Pet. Coralife, part of Central Garden & Pet. Kent, part of Central Garden & Pet. Marineland, part of Spectrum Brands. Instant Ocean, part of Spectrum Brands. Jungle Labs, part of Spectrum Brands. Dohse Aquaristik Hobby and Dupla. API, part of Mars Fishcare. GoWildPeru Wildlife exploration in southern Peru. AqvaTerra Eco Travel in Uruguay. Margarita Tours Eco Travel in Peru. Amphibian Species of the World American Museum of Natural History. AmphibiaWeb University of California, Berkeley. German Society for Herpetology (DGHT; in German). Costa Rican Amphibian Research Center. LANZO Herb Cages (mostly German). E.N.T. Terrarientechnik (in German and English). Zilla, part of Central Garden and Pet. Exo Terra, part of Hagen. the wet spot, Portland, OR. The Cichlid Exchange, Portland, OR. All Oddball Aquatics, Eric Bodrock & Regina Spotti. Florida Exotic Fish Sales, Rick & Tamela Biro. Florida Tropical Fish Farms Association. GloFish® a debatable addition to the fish scene.